Thank you to all 14 teams who joined for our annual Quiz Night at The Queen Victoria, Syston last night. It was lovely to see long-standing supporters returning, along with new faces we hope to see you all again soon. A brilliant mixture of general knowledge, 1980’s and topical news rounds organised by our infamous quiz master Terry Jackson. Terry has supported our Quiz Nights for over 7 years and the event would not be the same without him! Many thanks go to The Queen Victoria, Zoe & Staff, for the delicious sandwiches generously donated and warm welcoming environment, adding to a successful evening. We look forward to returning again in 2020. 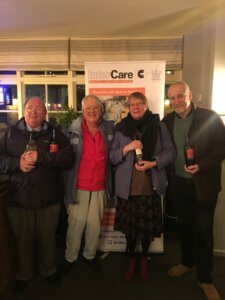 Congratulations to winning team ‘Knights of St Columba’ (pictured below) defending their title of second place in our 2018 Quiz and some, with a clear winning score of 151 and runners up were ‘Birstall Catholics’ with a score of 135! In total, the evening raised £540! Should you wish to be the first to know our 2020 Quiz Night date, please contact Charlotte 0116 2695925 or c.wright.intercare.org.uk.